Kaddish is the traditional mourner's prayer, evoking our deepest faith and hope. It is considered a merit for the deceased to have these words expressed publicly. During the first year, Chabad House will recite Kaddish 3 times a day until the first Yahrzeit. 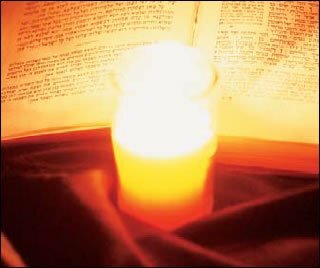 On the first yahrtzeit (and all subsequent years), Kaddish will be recited, Mishnayot will be learned, and a yahrtzeit candle will be lit. A yahrtzeit reminder letter will be sent annually to those specified on the Kaddish Request Form. On each Yahrzeit, Kaddish will be recited three times. A Yahrzeit candle will be lit. A Yahrtzeit reminder letter will be sent to those specified on theKaddish Request Form. . Donations may be paid in full or in monthly installments by credit card. Please click here to fill out the Kaddish Request Form in order to begin Kaddish immediately. As soon as we receive the name of the departed, we will start Kaddish. Upon receipt of payment, the name will be permanently instituted in our records. If you are unable to say Kaddish three times daily with a minyan, we can provide you with the peace of mind, by having Kaddish said by a dedicated young Torah scholar.